Mother’s Day arrives next weekend and if you don’t want to be left scrambling to nab the last wilted bouquet at the corner store on the way to visit the woman who birthed you, now is the time to start thinking about the perfect gift. I’ve scoured the internet high and low and put together a collection of my favourite gift ideas. You might notice a particular colour (or lack thereof) dominates. That’s largely because, for my own stylish mom, this timeless palette pretty much covers the entire spectrum in her sartorial universe, and it’s clearly rubbed off on me. Plus, black & white is a classic combo that’s always in style. So, whether your budget is big or small, you’ll find something here to help you express your love, in plain black & white. 1. Fresh flowers are nice, but for a bouquet that won’t wilt, try this graphic rose print tee ($39). 2. A personalized lucite tray ($68) can store jewelry, keys, or objets d’art, all the while looking clean and sharp. 3. The nautical feel of this striped scarf ($40) is perfect for the mom who loves to sail, or just loves the Riviera lifestyle. 4. A delicate beaded bracelet ($20) is a constant reminder of your love. Special note: Giftagram is offering CC readers $10 off. See below for the promo code. 5. Meow! This leopard print canvas tote ($39.50) is purrrfect for mom on her weekend trips to the market. 6. The price tag on this gold cuff ($12,700)is not for the faint of heart, but the classic design will never go out of style. Besides, mom has spent a lifetime spoiling you, isn’t it time you returned the favour? 7. 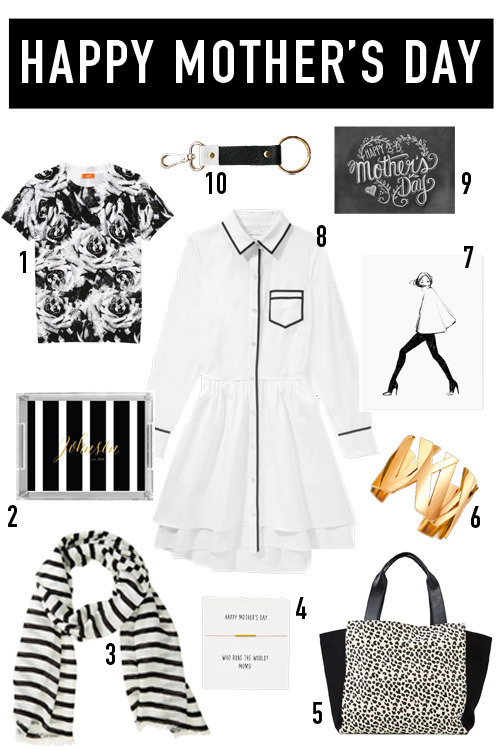 If you got your great sense of style from mom, thank her with a chic and timeless illustrated fashion print ($24). 8. A classic shirt dress ($395) works for moms of all ages, and the black trompe l’oeil outline adds edge to the crisp white. 9. The chalkboard message rendered on this card ($5) shows your love can’t be erased. 10. A simple leather keychain ($29) looks sleek and chic in black and gold. UPDATE: Giftagram is offering Curious Citizen readers a $10 credit toward any gift. Enter promo code CURIOUSCITIZEN10 at checkout.